It's Friday night of a holiday weekend! Woo! No work till Wednesday (I took Tuesday off)! Yay! To celebrate, I knew I wanted to have comfort food for dinner, so when I saw this recipe talked about earlier this week on veggieboards.com, I knew I wanted to give it a try. After reading the reviews on vebweb.com, I knew not to expect this to taste like Kraft or any other mac and cheese recipe. What I didn't expect was the distinct, yet yummy, taste and the richness of this dish. Wow! As a lacto-ovo vegetarian, I never knew vegan food could be so rich and decadent! Per suggestions on the reviews, I did make some modifications to this recipe... I only used 1 tsp of salt as well as 1 tsp of garlic powder. In addition, I used 2 cups plain soy milk and no water for fear the sauce would be too runny. It certainly wasn't! Mine turned out thick and creamy. So much so, that in the future, I may add in some of the water instead of omitting it. 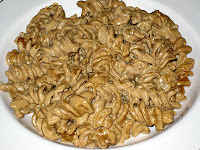 I also used fusilli pasta (I always think of Fusilli Jerry from Seinfeld!) because I found a package of it hidden in the back of my cupboard. I thought about halving the recipe as suggested on VegWeb, but with the holiday weekend ahead, I didn't mind the thought of leftovers in my fridge so I wouldn't have to cook as much this weekend. Hope it tastes as good reheated, or I'm in trouble! Cuz the recipe as stated makes a lot of pasta. When I do reheat, I think I'm going to try adding in veggies to help counteract the richness of this dish.